On a chilly night, Vicky (@kiki_BFF) and Justine (@foodigatorJ ), and I headed out to Swish By Han (@Swish_by_Han) to try out their food. I actually have never heard of this place, so I probably never would've stumbled upon this place if it weren't for their suggestion. It wasn't even until I sat down at the restaurant and looked at the menu that I knew they served Korean food. The eclectic dining room decor and dimly lit ambiance is very atypical of most stereotypical Korean restaurants. And the food? While they do serve some what of a fusion style Korean, it was 2 thumbs up for me! Once we sat down, a friendly waitress handed us a clipboard with a couple pages of paper that consisted of the menu. I quite liked this over the traditional fold over menus. 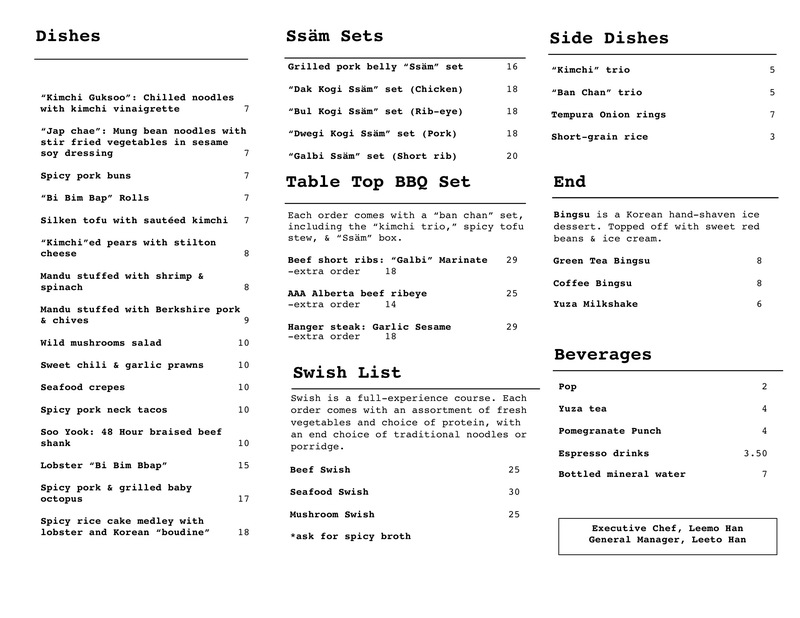 Swish doesn't offer a very elaborate menu, but it's sufficient and excellent for sharing! I wouldn't have known it until Justine (who is Korean) said so, but apparently this is a very traditional Korean dish. It was an interesting one to me. The Soo Yook is thinly sliced and served with a sesame oil heavy side salad. The beef was tender and very flavourful, and almost melted in your mouth because of how thin it was. However, I felt this dish lacked substance. Definitely not as filling as some of the other things we ordered that night. I don't think Justine or Vicky enjoyed these very much, but I acutally really liked these. As you can see, this was just one spicy pork bun cut into 4 pieces, but they were a good size for people who just want to sample multiple items on the menu like us. The spicy pork wasn't too spicy (was actually on the sweeter side) and was very saucy. Luckly, there was the perfect amount of bun to counter it. I must admit they weren't the best thing we ordered that night, but I wouldn't rule it out as being well made and delicious. Sauciness must be their style here, because just like the Spicy Pork Buns these tacos were loaded with toppings and sauce! It was quite a mess to eat, I don't know how you were supposed to close the tortilla! Not complaining though, it was a big pile of delicious! But be warned, if you have a weak tongue for spices like me, you'll find the pork neck very spicy. Not in painfully bad way though, and it definitely wouldn't deter me from ordering these irresistible tacos again. I just realized now how much pork we ordered that night! If I had to choose one pork dish to rid of, it would probably be this one. Swish by Han actually has a couple types of Ssam sets (rib eye, chicken, short rib), and they all come with rice, kimichi, and lettuce wraps for your meat. I usually love pork belly. In any and all forms. But this one here didn't quite live up to the expectation. What I didn't enjoy, was how burnt the pork belly was. The outsides were completely charred! The pork belly also wasn't fatty enough. If I wanted lean, I would order regular pork! Our waitress who was so friendly the entire night, let all of us take pictures of the bi bim bbap before she mixed it up. I think as a result a lot of the rice at the bottom were crisper than the rest. I actually liked it a lot like that! Perhaps you can give that a try next time too? While I love bi bim bbap, but I wasn't jumping out of my seat about this one. I personally didn't taste any lobster and didn't find there was anything too special about it warranting the $18 price tag. Quite ordinary. After a less than impressive pork belly from the Pork Belly Ssam, I was happy that Swish redeemed its pork belly reputation with these Steamed Pork Buns! They were heavy on the sweet Hoisin sauce, and loaded with radishes, pickled ginger, and other greens. It gave a nice crunch to the fat and buttery pork belly. The bun itself was a bit cold, but not stiff or hard. But to be honest, the pork belly was just too good to even notice anything else. I would strongly suggest ordering this over the Pork Belly Ssam!